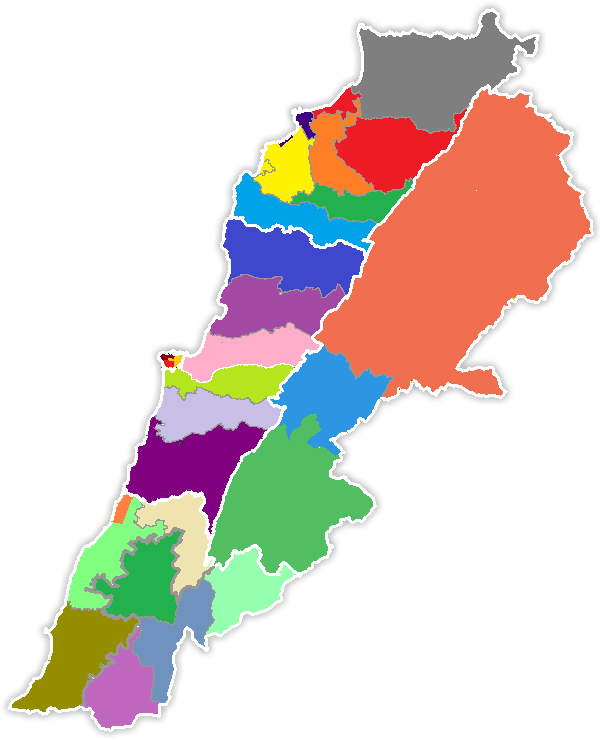 Lebanon’s Electoral Map According To The Lebanese Forces Hybrid Law. The colored districts are the small winner-takes-all ones and the big ones within the white line are the big districts under proportional unlike in the picture. There has been a lot of talk on a hybrid Proportional-Representation/ Winner-Takes-All electoral law in the past few weeks, and almost all the parties (PSP, Phalanges, Amal, Lebanese Forces) gave their proposals of hybrid laws in the electoral committees. The different hybrid draft laws are very similar to each other and mostly differ in the percentage of MPs elected by proportional representation (30%, 40%, 50%) but less in the constituencies’ boundaries (Small districts for the winner-takes-all seats and big ones for the PR seats). I’m going to review the draft law proposed from the Lebanese Forces. You can see the criteria of the law here. The laws allocates the seats on the basis of a certain criteria that you can see here. However, a big number of the districts don’t obey to any of the criteria. For example, in Jezzine the Greek Catholics aren’t considered to be a minor sect in the district so the seat stays in the caza and doesn’t shift to the governorate. That’s only one example, and there’s a lot more. Apparently the Christian seats are taken as one block and the minor Christian sects’ seats within a Christian district with a Maronite majority don’t go to the Mohafazas and stay in the caza. The lawmakers need to clarify a few things. Also, there are other districts where the criteria is missing something or doesn’t match the district’s seat repartition. For example, why is it that the Protestant seat gets transferred from Beirut I to the Governorate and not the Armenian Catholic one? Among other things that makes this draft law odd is the disproportion of seats within the majoritarian system. 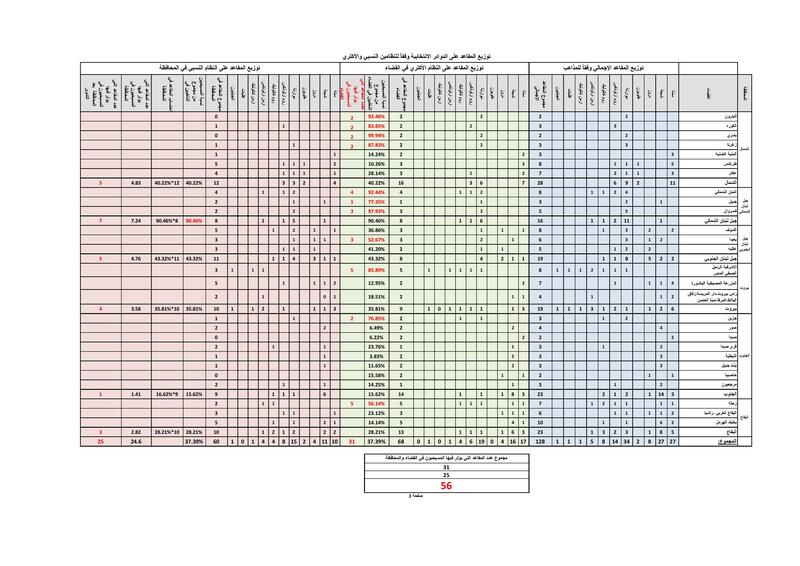 For example, Akkar, where 120608 voted in 2009, has 3 seats, while Bcharre that had 17183 voters in 2009 has 2 seats. 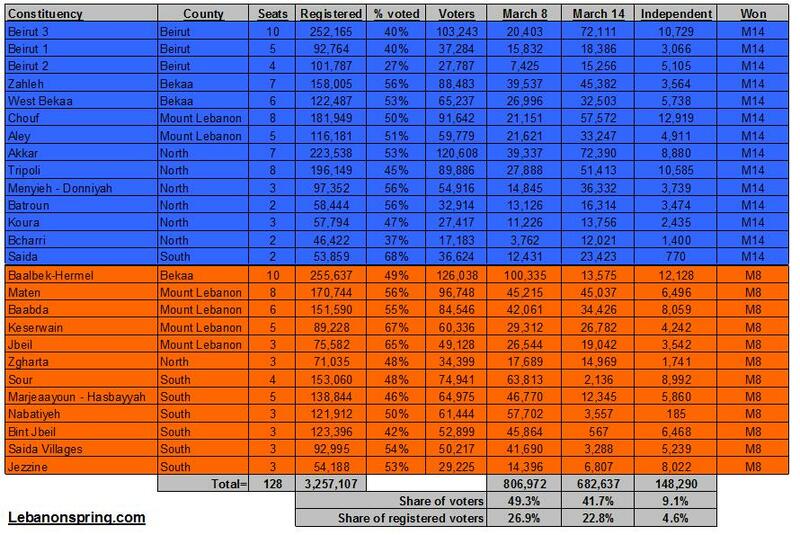 Bcharre voters are 4.55% of the North’s voters, while Akkar voters are 31.96% of the North voters. That means that on the Mohafaza scale, the Akkaris get to choose 31.96% of 12 MPs which is 3.83 MPs. A total of 3.83+3=6.83 MPs for the people of Akkar, while Bcharre gets to choose 4.55% of 12 MPs which is 0.55 MPs. A total of 2+0.55=2.55 MPs for Bcharre. 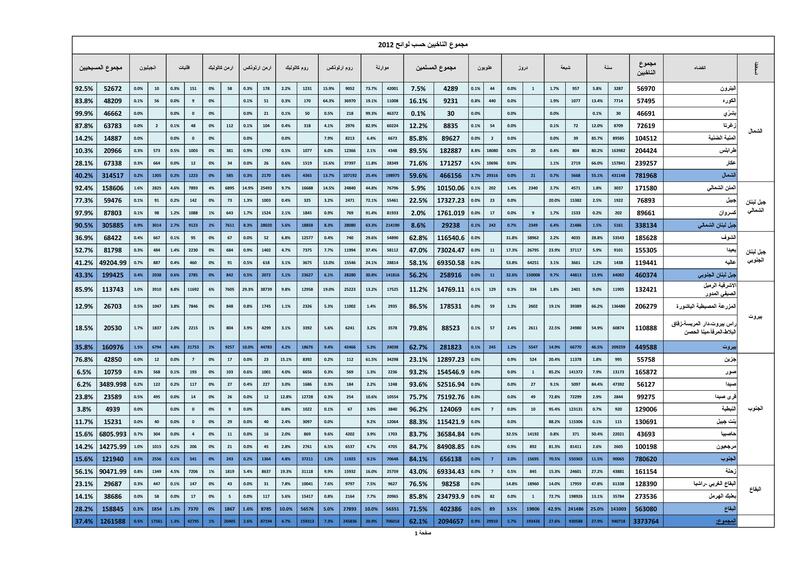 the number of electors in Akkar are 7.01 times more than Bcharre, which means that Akkar should have 7 times more MPs. Ironically it only has 6.83/2.55= 2.67 times more than Bcharre. That disproportion between the districts will be present in almost all hybrid laws, because some districts get to have more influence sometimes even though they have a smaller population. And after all, that’s how the law gives more influence to Christians. When the Akkar (66% Sunni) district should be as 7 times more influential than Bcharre (100% Christian) and is instead only 2.67 times more influential, you get to understand how the Christians, 38%, will be able to elect 56 MPs (43.75%). A big number of the small districts happen to be mainly Christian and that’s how the Lebanese Forces draft law can boost the number of the Christian-elected MPs. I’m going to consider that the Lebanese are reluctant to change, elect the same MPs again and again and apply the results of 2009 on the Lebanese Forces law. M8: Zgharta (2), Metn (3/4), Jbeil (1), Kesserwan (3), Beirut (5), Baabda (3), Jezzine (2),Tyre (2), Saida Villages(1), Nabatiyeh (2), Bint Jbeil (2), Marjeyoun (1), Baalbak-Hermel (5). A total of 32/68 seats in the Winner-takes-all districts for M8. PS: For Beirut the constituencies changed, so I consider edthat the votes of Ahrafieh-Rmeil-Saifi-Mdawar will go for M8 because of the Armenian votes (29% Orthodox, 6% Catholic) that exceed the Sunni ones (9%), and that the other two districts are under a Sunni majority, making M14 win them under a winner-takes-all system. I also consider that the agreements of Doha splitting the Beirut 2 seats equally between M14 and M8 are now history. For the Governorate of Beirut (Proportional Representation), I use the same results as 2009. 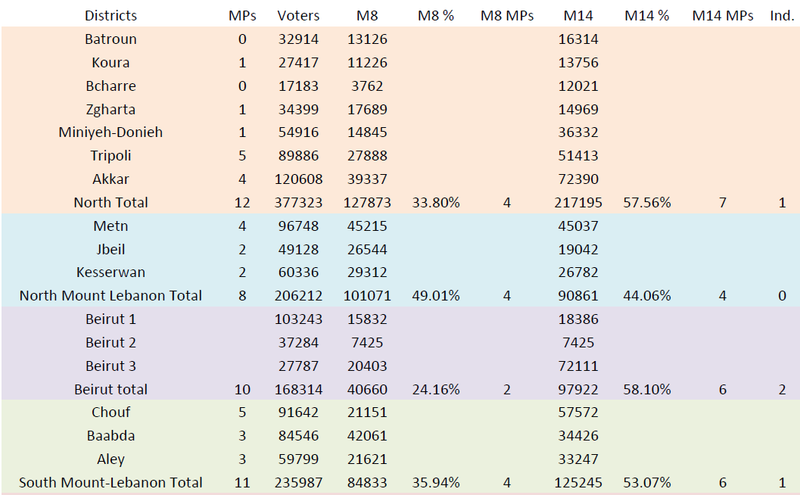 UPDATE: A friend kindly pointed out that I made mistakes while summing up the votes for Beirut, making the results 25.93% for M8 and 62,83% for M14, giving an extra MP for M8 and no extra one for M14. PS: I don’t know what the minimum threshold (The minimum percentage that a list should have so that it an get one of its candidates elected) will be, so I made the assumption that it would be somewhere around 10%. That’s why you will notice the presence of independent MPs. That means that the final outcome is 64 MPs (28+36) for M14, 59 (UPDATE: 60) MPs for M8 (27+32) (UPDATE: 28+32), and 5 Independent MPs (UPDATE: 4). As you can notice, if the results are the same as 2009, no one gets the majority of 65 MPs, we have an independent breach, and the results are extremely close. That means that with this law, predicting the electoral results will be a bit hard as it will be a fierce electoral battle. Too much electoral draft laws, Too Much. Posted in 14 March Alliance, 8 March Alliance, Lebanese Forces, Lebanese Politics, Parliamentary Elections, Politics on February 18, 2013 by Ramez Dagher.